Here is an example of a typical phishing email. It appears to come from "McGill University", but isn't really from McGill. 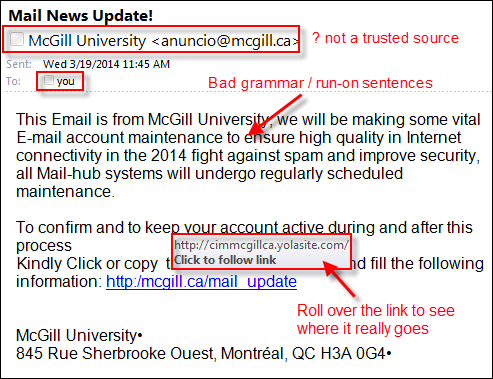 It contains a link that appears to go to a McGill site, but if you roll over the link, it's not. There are run-on sentences. See other example emails showing the telltale signs of phishing. When in doubt, report suspicious emails to the IT Service Desk. Suspicious email in your inbox? Let us know!